When I first started out reading about Unico American Corporation $UNAM I was expecting to just use this as a learning experience since this is the first insurance company that I have truly evaluated. I was planning on learning the important insurance industry terms, what they meant, how they affected the company in question, what the float was and how that affected the company’s operations, etc, and analyzing the company using all the knowledge I have gained lately from my recent foray into studying float and put those findings into an article. I was not expecting to find what I did: A company that is undervalued by EVERY ONE of my estimates of value, a company that has been for a number of years very disciplined and conservative in its estimates, which I found are of utmost importance in the property and casualty insurance business, and a company that has had underwriting profits every year since 2004, which I found out is really hard to do. If I had the capital available I would love to own this entire company and to build my investment firm with this company at the core, a la Warren Buffett with Berkshire Hathaway and its insurance companies. However, unless someone out there would like to endow me with nearly $100 million I will just have to be happy buying shares in UNAM and watching my money compound into the future. UNAM is a relatively small (Current market cap around $65 million) holding company whose main subsidiary, Crusader, is a property and casualty insurance company who writes insurance only in the state of California. The vast majority of its operations (around 98%) are in commercial multi peril insurance writing. UNAM also has some other subsidiaries that operate in various insurance related industries, but for this article I am only going to concentrate on Crusader and UNAM as a whole as its other subsidiaries contribute only fractionally to UNAM’s results. UNAM used to write insurance in a number of other states but decided to concentrate only on California as it was generally losing money on its insurance operations in those other states. UNAM is still licensed to write insurance in several other states so it may choose to expand back into those areas but at this time it appears to be content expanding throughout California. The below quoted areas are from UNAM’s annual reports about the previous business in other states and why its management decided to stop those operations. “In 2002 the Company began to substantially reduce the offering of insurance outside of California primarily due to the unprofitability of that business. In 2004 all business outside of California had ceased. In 2002, primarily as a result of losses from liquor and premises liability coverage which had rendered much of the Company’s business outside of California unprofitable, the Company began placing moratoriums on non-California business on a state-by-state basis. By July 2003, the Company had placed moratoriums on all non-California business. The Company has no plan to expand into additional states or to expand its marketing channels. Instead, the company intends to allocate its resources toward improving its California business rates, rules, and forms. As you will see throughout the rest of this article, UNAM’s operations have changed drastically for the better since those decisions were made. Below are descriptions of UNAM’s insurance business taken from its annual reports. Emphasis is mine. The insurance company operation is conducted through Crusader. Crusader is a multiple line property and casualty insurance company that began transacting business on January 1, 1985. Since 2004, all Crusader business has been written in the state of California. During the year ended December 31, 2011, approximately 98% of Crusader’s business was commercial multiple peril policies. Commercial multiple peril policies provide a combination of property and liability coverage for businesses. Commercial property coverage insures against loss or damage to buildings, inventory and equipment from natural disasters, including hurricanes, windstorms, hail, water, explosions, severe winter weather, and other events such as theft and vandalism, fires, storms, and financial loss due to business interruption resulting from covered property damage. However, Crusader does not write earthquake coverage. Commercial liability coverage insures against third party liability from accidents occurring on the insured’s premises or arising out of its operation. In addition to commercial multiple peril policies, Crusader also writes separate policies to insure commercial property and commercial liability risks on a mono-line basis. Crusader is domiciled in California; and as of December 31, 2011, Crusader was licensed as an admitted insurance carrier in the states of Arizona, California, Nevada, Oregon, and Washington. The property casualty insurance marketplace continues to be intensely competitive as more insurers are competing for the same customers. Many of Crusader’s competitors price their insurance at rates that the Company believes are inadequate to support an underwriting profit. While Crusader attempts to meet such competition with competitive prices, its emphasis is on service, promotion, and distribution. Crusader believes that rate adequacy is more important than premium growth and that underwriting profit (net earned premium less losses and loss adjustment expenses and policy acquisition costs) is its primary goal. Nonetheless, Crusader believes that it can grow its sales and profitability by continuing to focus upon three areas of its operations: (1) product development, (2) improved service to retail brokers, and (3) appointment of captive and independent retail agents. The property and casualty insurance industry, P&C insurance, has been in what is considered a “soft market” since 2004. UNAM has been disciplined enough during this “soft” insurance market of the past 8 years to achieve underwriting profits every year since 2004. As I will detail later that feat has been very hard to come by for other P&C insurance companies and is extremely impressive. The strict discipline to keep prices high enough to retain that underwriting profit has led to loss of business since 2004; net premiums written have dropped from $33 million in 2007 to just under $27 million in 2011. All numbers throughout this article are in millions $US unless otherwise noted. The surplus ratio is supposed to be under 300% so UNAM is well underneath that. 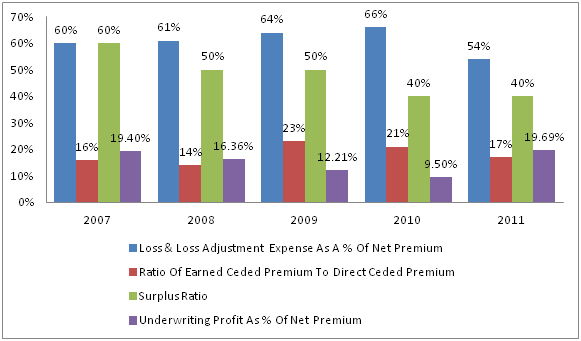 The underwriting profit as a % of net premium has consistently been between 9%-20% since 2007. Very impressive profit margins especially in comparison to some of the other insurance companies I researched and will talk about later who of underwriting losses. The statutory capital and surplus numbers is the amount of extra money after all liabilities and assets have been properly calculated according to the accounting standards. Generally the higher the better and the more money the company has to potentially invest and pay out claims with. Dividends can be paid out of the surplus capital as well. I estimated what its profit numbers are for the whole of 2012 and I estimate an underwriting profit of 4.92, net premiums written of 33.21 and underwriting profit as a % of net premium of 14.81%. I did not include those in the above chart because those numbers are not official. Last week I wrote about my conversation with Mr. Lester Aaron the CFO of the company and wrote my notes in this post. After thinking about it some more and after further research I am glad that UNAM has taken the attitude it has to be extremely disciplined and conservative in its investments as those decisions have generally paid off as I will show below. After looking at some of its competitors I also noticed that P&C insurance companies generally invest 5% and less of their investment funds in equities to be sure that they have funds on hand in case of a catastrophic insurance event so UNAM having no investments in equities does not appear to be as out of line with industry norms as I first thought. However, I think that UNAM should invest its $2 million self imposed limit in equities to earn at least a somewhat better return than the about 1% it is earning now—If UNAM management is interested and listening I could send some ideas to them, companies that I think are good long term bets that are undervalued 🙂 — or at the very least get a bit more aggressive with buy backs and/or pay out more consistent special dividends with that money so that shareholders can put it to use. Earning 1% on investments is pretty much useless over the long term so I hope management continues to do or starts doing some of the above things. In the past several years UNAM has occasionally paid out special dividends and bought back some of its shares. Float/operating assets=71.66/2.06=34.79. Float is supporting operating assets almost 35X. Float is considered to be “free money” in this case because UNAM earns an underwriting profit and has since 2004. As I found out while researching other insurance companies to compare to UNAM, underwriting profit over a sustained period of years and the discipline to achieve that is very difficult. I looked at around 5-7 other insurance companies combined ratios and underwriting profits and found that only a couple of them had underwriting profits for more than two out of the last five years, and generally their combined ratios got much worse in the last three years. 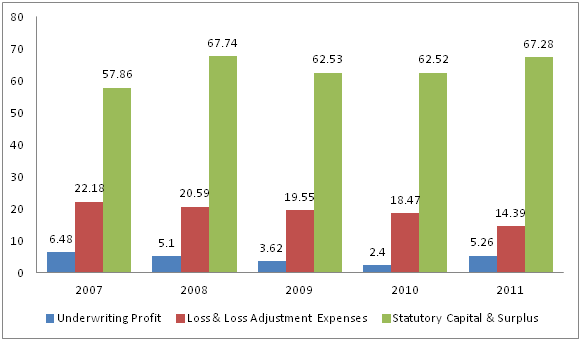 All of that makes UNAM’s sustained underwriting profits since 2004 all the more impressive. Below are two of UNAM’s competitors that I compared it to and their ratios. 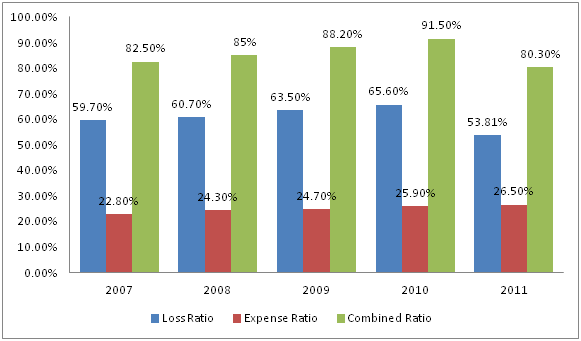 Of particular note is the giant leap in both companies Loss and LAE and combined ratios since 2007. Those numbers are generally much worse than UNAM’s ratios as you will see below. UNAM’s ratios have generally either stayed the same or gotten better since 2007. A drastic contrast to the other insurance companies I looked at, almost all of whose combined ratios have gotten worse since 2007. Also of note are how the companies risk based capital ratio compares. Numbers are supposed to be over 200% or insurance regulators may sanction or even take over the company as the company is deemed to be under potentially serious financial risk if its ratio is below 200%. 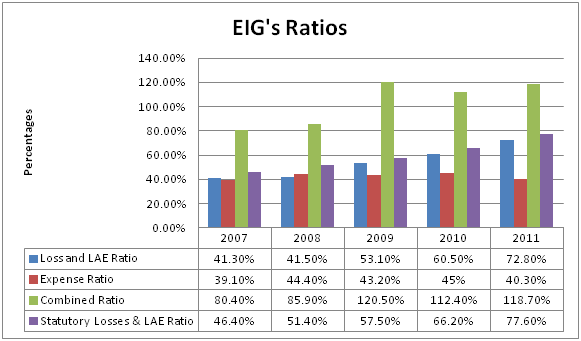 Employer’s Holding’s $EIG does not state what its RBC ratio is and only says that it exceeds the minimum requirement. I found that a lot of the other insurance companies I looked into also did not state what their RBC ratio was. 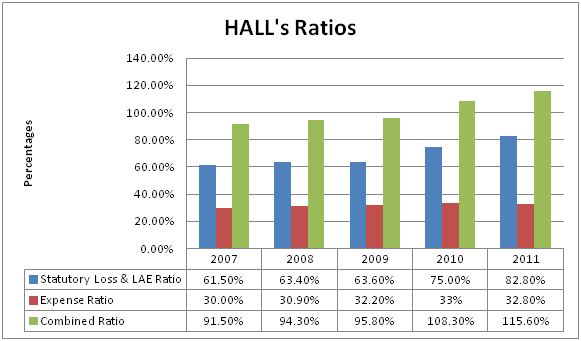 As you can see Hallmark Financial $HALL ratio has been under the minimum recommended 200% for a few years now. I found out pretty quickly into my research that of paramount importance in the insurance industry is management discipline and conservatism. UNAM’s management has shown an impressive amount of both and it has paid off as all of the company’s ratios have improved, sometimes substantially for the better as a lot of its competitors ratios are getting worse. I found it very curious that pretty much all the insurance companies I looked at said that they were more primarily concerned with underwriting profits even if that meant that the number of premiums written declined. The reason I found that curious is because almost all of those other companies had underwriting losses going back several years, sometimes while premiums written had been growing. So in some cases the other companies managements are at worst outright lying to its shareholders or at best being disingenuous with their stated underwriting policy as it relates to profitability. UNAM’s managements focus, discipline, and conservatism appears to be an amazingly exceptional outlier in comparison to the other P&C insurance companies I looked at in terms of producing consistent underwriting profits. Generally there aren’t any barriers of entry into the P&C insurance industry. The main advantage a company can gain is to be the low cost operator, but that sometimes comes with an underwriting loss as well. UNAM is a controlled company as Mr. Erwin Cheldin-former CEO, president, and chairman of the board of UNAM, Founder of UNAM, and father of Cary; Cary L. Cheldin-Chairman of the board, president, and CEO of UNAM, son of Erwin Cheldin; Lester A. Aaron-treasurer, director, and CFO of UNAM; and George C. Gilpatrick-director of UNAM, hold approximately 53.20% of the voting power of the Company and have agreed to vote the shares of common stock held by each of them so as to elect each of them to the Board of Directors and to vote on all other matters as they may agree. Biglari Capital, run by activist investor Sardar Biglari who tries to emulate Warren Buffett, owns 9.48% of UNAM. His fund has had recent discussions with UNAM. Nothing to report yet but Mr. Biglari has already tried to buy an insurance company before. Schwartz Value and Ave Marie Catholic Values combined own 8.51% of UNAM. Dimensional Fund Advisors owns 8.73% of UNAM. All of the above shareholders combine to own 79.92% of UNAM. Combine that with various other funds that own smaller portions of UNAM and probably under 10%, less than 500,000 shares, of the company’s shares are truly outstanding. Cary Cheldin and Lester Aaron, both of whom are executives of UNAM, are also on the company’s competition committee. On September 29, 2003, the Company borrowed $1,000,000 from Erwin Cheldin, director and the Company’s principal shareholder, president and chief executive officer, and $500,000 from The Cary and Danielle Cheldin Family Trust. Very dedicated and committed shareholders and owners. Book value per share has been rising. The nine year average book value per share is $11.36 per share and currently UNAM’s TTM book value per share is $14.12 per share. UNAM is currently selling for less than its book value per share. Revenues have dropped every year since 2004 when the soft insurance market started from a high of 62 down to a present TTM of 33. UNAM has a negative EV, TEV/EBIT, and EV/EBIT. UNAM’s AM Best rating is A- which is deemed excellent. The AM Best rating is a measure of financial strength. UNAM has four reinsurers all of whom have AM Best ratings of A of higher. UNAM looks to be properly covered if a catastrophic insurance event happens as it carries a substantial amount of short term investments, currently worth more than its entire current market cap, it has substantial statutory capital and surplus, also currently worth more than its current market cap, and adequate reinsurance. Valuations were done using UNAM’s 2011 10K and 2012 third quarter 10Q. All numbers are in millions of US$, except per share information, unless otherwise noted. This valuation is expecting 1% interest rates for the long term and no growth in float over time. (float X 10%) + Equity=estimated value/number of shares. (71.66 X 10%) +75.23=82.40/5.3=$15.55 per share. Float + Equity=estimated value/number of shares. Current share price is $12.25 per share. UNAM appears to be massively undervalued. There is a 22% margin of safety to my absolute minimum estimate of intrinsic value. I actually think UNAM’s true intrinsic value is somewhere in the $25-$35 range which would either be a double or triple from today’s prices. These estimates of value do not even count the companies potential future growth in float, premiums, and investable money over time. My estimates of value also do not count on the insurance industry as a whole improving either, which will happen eventually. UNAM’s downside is at least somewhat protected by its investments as well as it is currently selling for less than just the value of its short term investments, which mostly consist of cash, cash equivalents, and CDs. Current per share value of short term investment is $14.72 per share. I also found UNAM to be undervalued with every one of my other valuations. UNAM is selling for less than just what its float is worth per share at book value, $13.52 per share. UNAM is selling for less than the per share value of just its net assets after subtracting all liabilities including float, $14.15 per share. UNAM is undervalued by every one of my estimates of intrinsic value. As an example, UNAM’s per share price is lower now than the per share value of JUST its short term investments. UNAM’s management looks to be very disciplined and conservative, which I found is of absolute importance in the insurance industry. Sardar Biglari, an activist investor, has recently bought just fewer than 10% of UNAM and may look to buy it outright as Mr. Biglari has already tried to buy an insurance company before. At the very least he could try to help unlock some of the value of UNAM’s shares by working with management and has already had contact with UNAM management. UNAM has a negative enterprise value. This article from Greenbackd explains why that can be a good thing for shareholders as a negative enterprise value can mean a value dislocation. UNAM has earned an underwriting profit every year since 2004. More impressive is that 2004 started a soft market in the insurance industry which generally means it is harder to earn an underwriting profit. Even though UNAM is only earning 1% on its investments currently, UNAM still should have enough funds on hand to pay claims if a catastrophic insurance event happens as its surplus and statutory capital has grown substantially in recent years. UNAM actually has more in just statutory capital and surplus than its current total market cap. UNAM also has more in short term investments than its current entire market cap and it also looks to be adequately reinsured. Book value per share has been rising in recent years. UNAM’s management seems to be dedicated to the company as the current CEO and his wife loaned the company money in 2003 when it was having some problems. Although UNAM’s CEO and CFO are on its compensation committee, their pay seems to be fair to me. The former CEO, former president and founder, current CEO and president, and CFO own substantial portions of UNAM. In recent years UNAM has bought back some of its shares and paid special dividends on occasion because “We think that the shareholders can put the dividends to better use than I think that we can currently in the market.” Very shareholder friendly. My entire conversation that I had with Mr. Aaron that I linked to above gave me confidence in management and laid some of my concerns to rest. 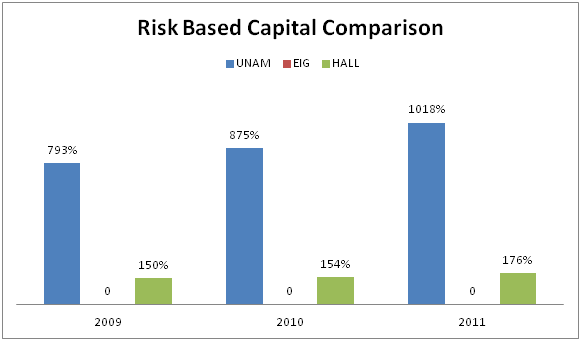 All of UNAM’s risk and insurance industry related ratios are far in excess of what they need to be and far better than its competitors that I looked at. UNAM’s float should be considered as free money and looked at as kind of a revolving fund since it earns, and has earned since 2004, underwriting profits. UNAM has no debt. Some of the other insurance companies I looked at had to take on debt just to keep their operations out of regulators hands in recent years. Revenue and premiums written have generally dropped every year since 2004. UNAM is currently only earning 1% on its investments. This could mean that if a catastrophic insurance event happens in the future that UNAM may not have enough money to pay claims. UNAM may be too conservative with the investments it owns and the company seems to have a lot of excess capital not being utilized at all currently. The current CEO and CFO are on UNAM’s compensation committee. Some would say that UNAM’s special dividends in recent years are just being paid to further pay the insiders of the company who own large portions of the company. Mr. Biglari could try to influence UNAM’s management to help unlock some of the value of its shares, or buy the company outright as Mr. Biglari has already tried to buy an insurance company before. An improvement in the overall insurance industry could help unlock the value of UNAM. A catastrophic insurance event in California would harm UNAM’s results. This experience of learning about float over the last month or so has been an amazingly rewarding experience. As a relatively new investor I am always looking for opportunities to learn new things and expand my circle of competence and I think that I will look back years from now and see that this time period of my value investing journey was a turning point in getting me closer to my ultimate goals of opening up my own investment firm. As icing on the cake I also ended up finding another company to invest in as UNAM is a company that is undervalued by every one of my estimates of intrinsic value, has potential catalysts in place to help unlock value, has had underwriting profits since 2004, and has very focused, disciplined, and conservative management. For all of the reasons I list above, UNAM is a company that I would like to own all of and build my investment firm around. Update as I was getting ready to publish the article. After I finished up writing the article at the end of last week I started reading The Davis Dynasty and realized I had a lot more I needed to learn about the insurance industry as a whole before being comfortable enough with my knowledge to make the decision to buy into UNAM. At this point I do not think that I have enough overall insurance industry knowledge to be able to make a definitive buy or sell decision so for now I am going to continue to learn about the insurance industry and when I feel I have enough knowledge, at that point I will make a definitive buy or sell decision about UNAM. Hopefully UNAM’s shares do not pop before I gain more knowledge as they are by far the best insurance company I have found up to this point but I do not want to repeat some of the mistakes I made in the past and buy something before I fully understand the business and industry. The new company I have been researching is $UNAM, a small property and casualty insurance company whose operations are in California. I still have further research that I am going to do on the company and I still need to value them, but to this point UNAM looks like a potentially good investment after reading its annual reports back to 2004 so far. I have come across a few concerns that I wanted to talk with IR about so I decided to call its IR department and I frankly wasn’t expecting much from because every other time I have called a company’s IR department I have either gotten no answers or they said they would call me back and still months later have not. Once the nice lady I talked to at UNAM’s IR department heard that I was a prospective investor and had some questions that I would like to ask, she patched me right into the CFO, treasurer, and director of UNAM, Mr. Lester Aaron. Over the time of our conversation, between 15-30 minutes, he took the time to answer all of my questions and he talked with me a bit about UNAM’s philosophy as it pertains to how the company invests shareholder and company money. Below are my notes from the conversation. Yesterday I had a conversation with the CFO of UNAM and had my first ever pleasant experience with a companies’ IR department. He took the time to answer all of my questions and laid some of my concerns to rest about the company. The bulk of my questions were about the company’s investment portfolio, currently only yielding around 1%, no investments in equities since at least 2004, and why there is a $2 million limit on equity investments. Some highlights are below. Multiple times he said that the company treats shareholder money as their own, that they concentrate on the long term, and doing what is right for shareholders. This was his major point of emphasis during the call. He thought that some of the other insurance companies were a bit crazy for writing premiums that led to an underwriting loss. UNAM has had an underwriting profit since 2004 during a “soft” insurance market. UNAM not compromising on the price of their policies to sustain the underwriting profit has led to a reduction in the number of premiums written in recent years. 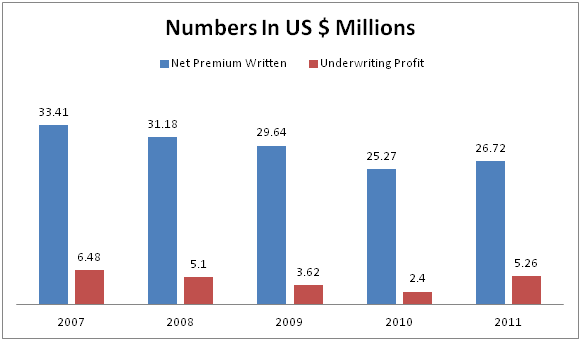 An underwriting profit every year since 2004 is especially impressive due to the “soft” or unfavorable trend in recent years in the insurance industry, and of course I would rather the company be profitable than it wanting to expand premiums recklessly. He did not want to “Gamble investor’s money” and he seemed to think that with all the risks around the world currently (Europe, currency, sovereign debt in the US and abroad, political issues, issues in the P&C insurance industry, etc) that UNAM felt that it would be gambling people’s money in the short term if they were to become a bit more aggressive with their investments. They think about what is best for shareholders “Not five months from now but five years from now” and that they would rather earn 1% on investments than take unwarranted risks with the capital it has at its disposal. The one quibble I had was that I think you can make more than 1% on investments without taking on a bunch of risk and still be able to pay insurance out when it needs to be paid, but he has a lot more experience in the P&C insurance industry than I do so I will trust their more experienced judgment. I trust that they will keep their investment money in low risk short term investments as dry powder waiting for an opportunity to pop up or the insurance industry to turn more favorable. Overall I came away very impressed with his answers and how he emphasized over and over again that they wanted to do what was best for shareholders over the long term. I still need to do further research and value the company but up to this point it looks very promising and I am impressed with the company’s shareholder friendliness and discipline. I will have my article written on UNAM as soon as possible and decide at that time whether or not to buy into the company.